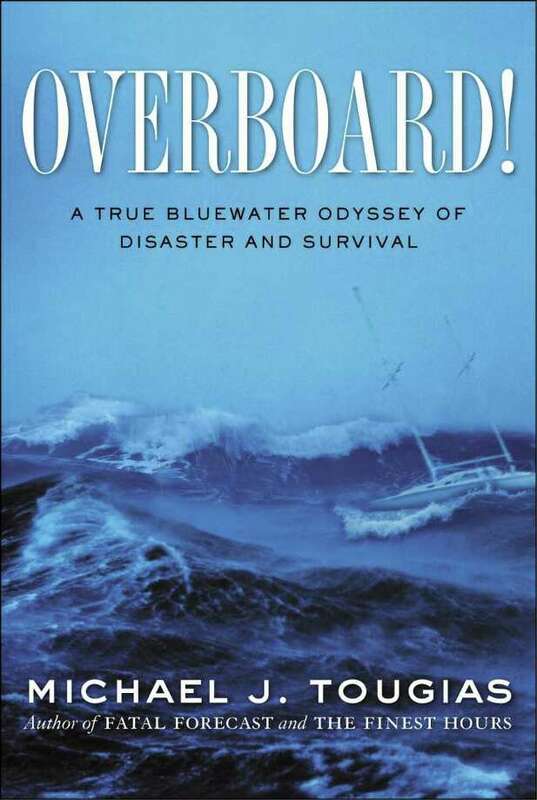 Michael J. Tougais' book, "Overboard!" Lochlin Reidy will never forget Mother's Day, but not for the usual reasons. It's the day the 63-year-old father from Woodbridge nearly drowned. On May 6, two days before the sixth anniversary of his rescue, Reidy and maritime disaster author Michael Tougias recalled Reidy's brush with death to members and guests of Southport's Pequot Yacht Club. Reidy was first mate of the 45-foot Almeisan on his way from Bridgeport's Black Rock Harbor to Bermuda, when an enormous low-pressure system took shape over the Gulf Stream and much of the North Atlantic. The first mate, captain Tom Tigue and their crew of three were caught in the middle of the preseason hurricane, about 300 miles north of Bermuda, and battling to keep the sailboat on course. The Almeisan was equipped with a hardtop cockpit which gave the crew a false sense of security, Reidy said. Although they were gripped with debilitating seasickness, the captain and first mate hoped they could ride out the storm. "When you're sitting in this little cocoon, and the wind's blowing 45, 50 miles per hour, it seems not that bad," Reidy said. Then, the first rogue wave hit, an unpredictable, mountainous monster much higher than the surrounding swells. "Water has a way of not doing what it's supposed to do," said Tougias, who documented the Almeisan's journey in "Overboard! A True Bluewater Odyssey of Disaster and Survival." The wall of water barrelled into the sailboat, overturned the 44,000-pound Almeisan, smashed in a window, and knocked crew member Kathleen Gilchrist into the roiling sea. Gilchrist was secured to the boat by a safety harness, but it took Tigue, Reidy and crew member Chris Ferrer all their strength to pull her back in. The crew was shaken, but alive, and the storm battered on as they struggled to bail out the boat and stay on their feet. "I looked down, and the window was on the cabin sole, and there was about a foot of water" inside the Almeisan, with more coming through with each wave, Reidy said. It was then that captain and first mate made the call to ready the life raft and activate the Almeisan's Emergency Position Indicating Radio Beacon, alerting the Coast Guard of their plight. But before they could abandon ship, the second wave again capsized the Almeisan, sending the lift raft adrift and throwing Reidy and Tigue into the ocean. "As I saw that boat drifting away, I heard a voice, and it was my friend Tom," Reidy said. The first mate swam to his captain, and the two clipped their life vests together. Then, they waited for a miracle. Separated from their boat, their crew, their life raft and the EPIRB -- the device that would have signaled their location to the Coast Guard -- Reidy and Tigue were trusting in luck and the search efforts of emergency personnel hundreds of miles away to find them. Fighting back tears, Reidy recalled watching his friend die. He vowed to bring Captain Tigue's body back home to his family, and made this a mantra during his long fight against the ocean. Tougias said Reidy's story should serve as a warning and inspiration for the boaters at Pequot. "I kept asking myself, `How could (he) do that? I could never do that,'" Tougias said of Reidy's will to survive. The Almeisan's first mate summed things up simply. "In all of that horror that was out there, I had to think positive," he said. "Negative thoughts were so debilitating, the next thing would be to just throw your hands up and give up." He said it was the small victories -- making it over another wave and trough; learning to breathe amid the turmoil; repairing a strobe light and signaling for help -- that kept him going. He thought of his daughter, Ashley, and all the softball games and swim meets he would miss if he didn't return home. Reidy thought of his captain and friend, and the promise he made to himself to bring him home. Reidy spent 24 terrifying hours in the water before being rescued through the coordinated efforts of the Coast Guard and volunteer rescue ships. The Almeisan crew were retrieved via helicopter and rescue swimmer. "I can't speak highly enough about the Coast Guard," Reidy said. "They're really, really, really a gift to all of us. They'll do anything for us, it's beyond comprehension what they'll do, the danger they'll put themselves in for us, to save us." As members of the Pequot Yacht Club and other mariners get ready for the summer boating season, Reidy offered some advice. "Be prepared and have a plan and trust in the plan -- trust in the people out there to carry out the plan," he said. Reidy said he hasn't made many changes since his ordeal, but he tends to take life a lot less seriously. Pointing to the golf course across the inlet from the Pequot Yacht Club, Reidy described a new approach to the game: "Now, if I hit it in the water, no big deal," he said.